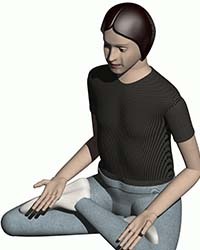 A fully poseable (and statistically accurate) model of a 15 year old (61 inch) child, configurable to look like a girl or a boy and including 5 or more preset postures (Sitting, Standing, Walking, Running, Driving…) and an installation file allowing the model to be dragged and dropped from your SolidWorks Design Library toolbar. Also includes adjustments to the size and trim of clothing, footwear, hair and even facial details. Advanced pose-control handles can be resized or hidden in a single operation. PhotoWorks textures are included which you can change to you own selections from your PhotoWorks library.